As a game’s codebase gets larger, it becomes more and more difficult to keep it all working all at the same time. This is one of the big reasons why I keep spending time trying to simplify MMORPG Tycoon’s codebase. Sometimes, though, that’s not enough, and little bugs creep in. The one I fixed today completely broke the advanced roads functionality. 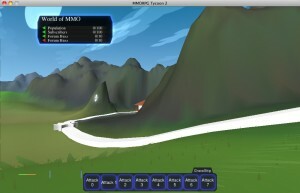 For example, creating a “road node” (here being drawn as a short “gear” shape) in order to make a road follow a non-straight course between buildings, such as here where it winds around a mountain, rather than going over the top of the mountain. I’m not sure how long it’s been broken, but my best guess is that it’s been ever since I implemented support for basic bridges. 11 April, 2010 in Full Games, MMORPG Tycoon.